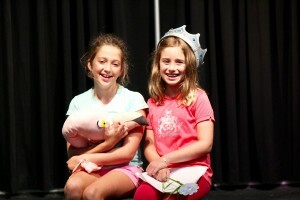 Students rehearse during the Crabpot Players summer camp. The final session of Crabpot Players musical theater summer camp saw campers performing selections from popular shows like Matilda, Hairspray, Cinderella, Les Miserables and more. 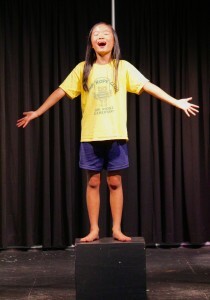 Campers worked independently and in small groups to focus on their talents. They also performed in larger group numbers and the instructors helped choreograph for their final performance. The Players are offering a Hamlet workshop next, Shakespeare’s “Hamlet” Performance Workshop for Kids, costs $200 plus $25 for costumes, props etc. and runs Mondays, September 14 through November 2 from 4-6 p.m.. The workshop is for ages 7-14. Students will get hooked on the Bard by performing creatively edited, melodramatically funny Shakespeare, using actual lines from his script! Crabpot follows up summer camps with a Hamlet workshop. Participants will be cast in principal roles and perform under the lights at the conclusion of the eight-week session. No experience necessary and a souvenir script is part of the registration fee. The Player’s education team will build on the fundamentals of acting with theatre games that use body movement, role-playing, and improvisation to help students become more knowledgeable about themselves, build teamwork, and relate to others.